It seems smartphone giants, Infinix Mobility Limited are not relenting in their bid to offer the best smartphone to its teeming users. We have a new device from Infinix Mobility on our hands – the Infinix Note 5. What informed the choice of this device was the widespread acceptance of the Infinix Note 4 and some feedback gathered which they wanted to improve on using the Note 5. The Infinix Note 5 is the anticipated flagship device from Infinix Mobility Limited for 2018. The device is an upgrade from its predecessor – the Infinix Note 4. Though still in the offing, likely specifications of the device are already making news and in this article, you’re presented with the impressive features packed in the Infinix Note 5. It is expected to have impressive features than what was obtainable on the Note 4. With the reigning dual rear camera feature on most smartphones, the Infinix Note 5 is expected to pack the same features alongside a bezel-less display and amazing resolutions. The fingerprint scanner will be situated at the front (just like the Note 4) and it comes with the additional feature on the Note 4 – the X-pen stylus. The device is also expected to feature an 18:9 screen to body ratio and a 4GB RAM. To speed up the phone’s processing, there is a 32GB ROM and the android 8.1 versions. Perhaps the amazing thing on the Infinix Note 5 is its inclusion of the Google Android One project which is responsible for keeping smartphones from bloatware. The device is powered by a 5, 000 mAh non-removable battery. The Infinix Note 5 price in Kenya ranges from Ksh 14,499 to Ksh 16,499 depending on where you make your purchase. The smartphone is available on top eCommerce sites in Kenya. The Infinix Note 5 is expected to hit the Nigerian market in the middle of 2018, precisely around June, 2018. It is expected to be launched alongside as it professional version – the Infinix Note 5 Pro. However, there will be a Global Launch of the device in Dubai on June 24, 2018. The Infinix Note 5 is expected to have the same design as the Note 4. The device has the latest dual rear camera and a bezel-less design. The fingerprint scanner will maintain its position at the front (just like the Note 4) and there’s a Corning Gorilla Glass 5 to protect its screen. The amazing X-pen stylus is not missing on the device. For the display, there is a screen to body ratio of 18:9 with the same screen resolution found on the Note 4. It will feature a 6.0 inch screen and a 1080 x 1920 pixel resolution and its pixel density is expected to surpass 400ppi. Infinix Note 5 will feature the latest dual rear camera and a front camera as well. There will be a rear 18 Megapixel camera and a 2MP sensor with dual-tone LED flash. On the front is a 13 Megapixel camera for your selfies and video calls. Rumors are rife that there’ll also be a flash on the front camera. There is a 5,000 mAh non-removable battery to power all you do with the Infinix Note 5. The battery features the popular quick-charge technology so you’re sure of a long-lasting battery and a faster charge when it drains. The hardware is definitely among the first points your thought will go to when choosing a smartphone. Sadly, the Infinix Note series are yet to feature the Qualcomm Snapdragon processor so we’re left with the Deca-core MediaTek processor for the Infinix Note 5. The processor is expected to be faster than that of the Note 4 and other predecessors. The device features a 4 GB RAM and an internal storage of 32GB. The device relies on the 2G, 3G and 4G networks for its connectivity. The yet to be launched Infinix Note 5 is expected to run on the Android 8.1 (Oreo) version. Though the device is yet to be launched, there are some key features that were found on it. Network:Infinix Note 5 will feature the 2G, 3G and 4G networks. So you have varieties of networks to select from. SIM Type: The device features dual Nano SIM. Connectivity:Due to scanty information regarding the device, it is not certain the type of connectivity the Infinix Note 5 will feature. It is certain that the device will feature a USB Type-C port. Another amazing feature the Infinix Note 5 spots is the Android One project from Google. Infinix Mobility Limited had earlier distanced itself from the project after its Hot 2 device failed to gather acceptance with the Google Android One project. 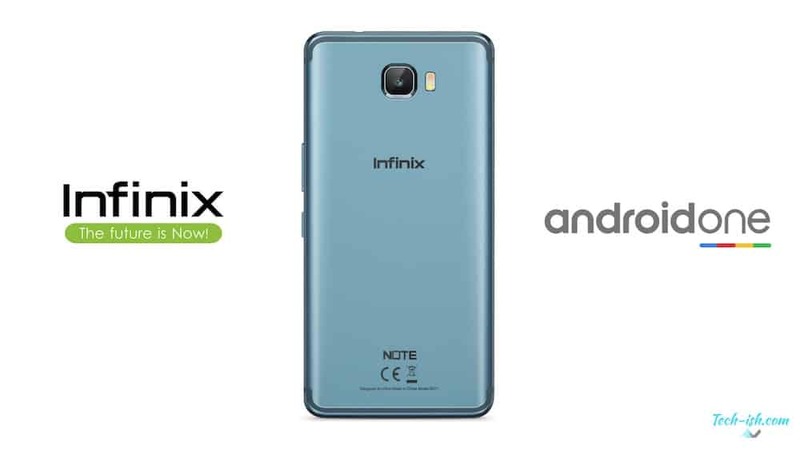 Perhaps Infinix Mobility made reconsideration as its forthcoming Note 5 will host the Android One feature. Here is a summary of Note 5 specs, including the Infinix Note 5’s Android 8.1, Octa Core 6GB RAM, 64GB ROM, Dual Rear Cameras, Touch Sensor, massive 5.98-inch display and 4350mAh battery. Though an upgrade to the Note 4, Infinix Note 5 will certainly make waves with its impressive features; from the X-pen stylus, the huge battery capacity and the re-introduced Android One project. Its pricing is expected to be about $199 which amount to about Ksh 14,499.